Classes offered at Creative-English Fujimino. Our ever popular Advanced class gives students the chance to join in the fun as we learn from the bestselling British ESL syllabus. This is the next step in students education once they reach the age of 6+. Our brand new Advanced Reading Club lets students learn pronunciation, reading and comprehension through to learning grammatical points and punctuation points through written text. 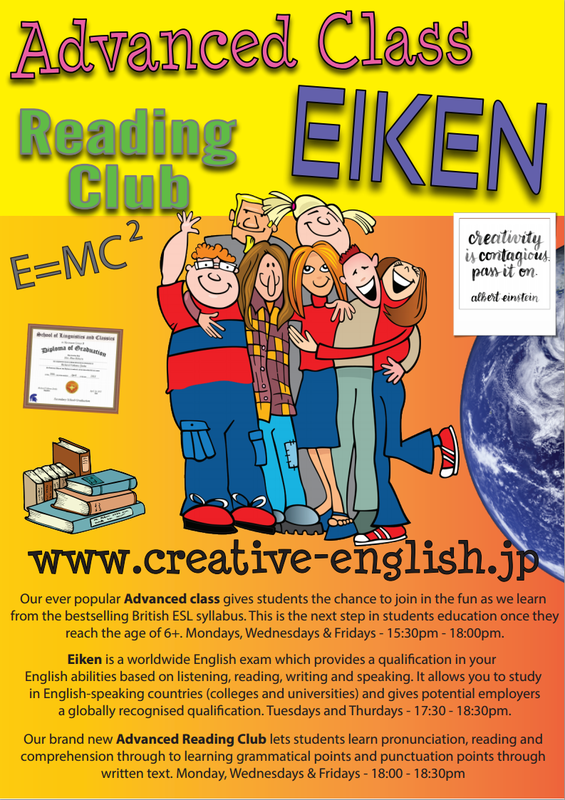 Eiken is a worldwide English exam which provides a qualification in your English abilities based on listening, reading, writing and speaking. It allows you to study in English-speaking countries (colleges and universities) and gives potential employers a globally recognised qualification. We offer a structured, creative and imaginative programme that will help each child to gain confidence in the English language and to achieve academic excellence. We offer exciting classes aimed at students between the ages 3-8 years old. Whether your child is English native, new to the language, or has basic English skills, our afternoon schedule will provide them with stimulating classes to build confidence through verbal, written and visual strategies. • Circle time based on music and movement and focusing on pronunciation, repetition, listening skills and language development. • Worksheet-based lesson that introduces a language concept (grammar, phonetics, descriptive text, speaking, reading etc). Each concept will follow the ESL curriculum. • An artistic and expressive class to reinforce the previously learnt concept - through art, cooking, science, games etc.